Family and Friends carry the Coffin of Alice Morrow into Roselawn crematorum. The Hearse carrying the coffin of Alice Morrow arrives at Roselawn. Family and Friends of Alice Morrow gather outside Roselawn as her remains arrive. 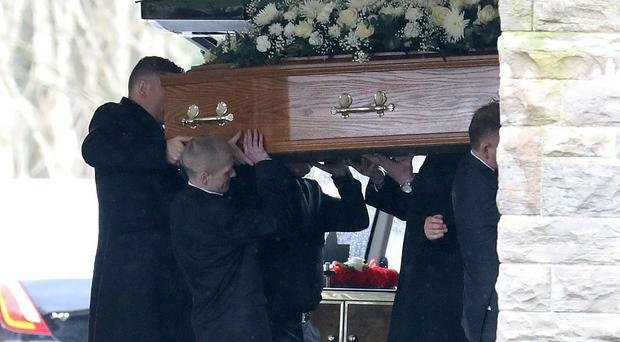 The funeral of murdered east Belfast woman Alice Morrow took place on Friday afternoon. Ms Morrow was found dead in her home in Whincroft Way in the Braniel estate on Sunday March 10. William Hutchinson (42), from Kilbroney House in east Belfast, appeared before Belfast Magistrates Court last Thursday charged with her murder. Her funeral cortege departed from her mother's home in Belvoir Drive for a funeral service at Roselawn Crematorium. Ms Morrow was the daughter of Roy and Maggie, mother to Glen and Kelly-Anne, and had three grandchildren, a funeral notice stated. Her family has asked for donations to be made in lieu if desired to Women's Aid.